What was likely regarded as a run-of-the-mill, made-for-TV music program in its original 1985 airing, now — almost twenty-five years later — inspires richer appreciation. 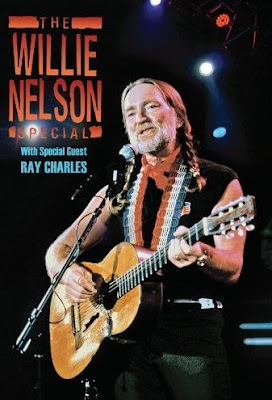 Filmed at the Austin Opry House, The Willie Nelson Special features the Red Headed Stranger hosting a somewhat informal though thoroughly enjoyable one-hour performance. Before what looks to be an inebriated dinner-theatre crowd, Willie exhibits his wide musical taste and versatility, dipping into his own irascible brand of outlaw country, bluegrass, standards, and pop with equal conviction. From the ramshackle shot of “Whiskey River” to the pensive lament in “Without A Song” to a poignant rendition of “Always On My Mind,” the latter complemented by his sister, Bobbie Nelson, on piano, Willie's genuineness comes through all that he plays here. Photos and footage of his hometown in Abbot, Texas — complete with requisite commentary by childhood friends and neighbors who fondly reminisce about little Willie — interspersed with a few songs, but they add little to the overall presentation. What does make The Willie Nelson Special, well, special, is the presence and the passion of Ray Charles. Above a measured arrangement, Ray holds the reins at his piano for a valiant duet with Willie on their classic, “Seven Spanish Angels,” which was a contemporary hit at the time. In turn, Willie leads the way through “Georgia On My Mind,” reprising his cover from Stardust only a few years prior. Of course, with the man whose version is Georgia's official state song sitting next to him, Willie (wisely) lets Ray have a go at it as well. After trading verses on “I Can’t Stop Loving You” — and, more to the point, once he hears Ray's voice follow his own — Willie shakes his head in awe. “You’re pretty good at that,” he teases him afterward, understating the obvious. The camaraderie that Willie Nelson shares here with Ray Charles is, in various yet fundamentally similar ways, mirrored in how he relates and performs with his band, which in turn enhances the overall performance. And so, while the audio on the DVD (5.1 Dolby Surround and DTS Digital Surround) is pristine and the video has been well preserved, it's the music that ultimately makes The Willie Nelson Special as good as it is.